Confident driving in snow. Great traction. I have had NO problems with my current tires. They are a great buy!!!! They were good, dependable tires. I would go with these tires again. Bought 2 tires last year. One had bubble, and the other one still has tread but dry rots easy. Might get rid of soon if dry rot worsens. These tires are okay for the price. I have gotten 2 years wear out of them. Good price without sacrificing performance. The tires lasted me a VERY long time, but in the rain, or any weather outside of sunny, it would lose traction and cause the car to drift. So far, so great! Looking forward to tackling the upcoming winter weather. Love these tires and would definitely buy them again! These tires are high quality in my opinion. I felt like I was driving a new car after these tires were put on my accord. I haven't had to drive in snow yet but they do great in wet weather. Great tire. Very predictable, high grip level for fast lap times. Find the tire noisy at highway speeds but most tires in this category are similar. Will buy again. 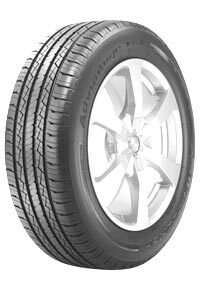 This is an excellent handling tire in foul/snowy weather as well as dry roads used on our van & I bought a set in a different size for our Pontiac G6. Combine great tires along with a great sales/service staff at Zurcher's Best One & you have a winning combination. Very nice tire and reasonably priced. These tires offer great stability and steering response. Smooth ride and last longer than expected. Purchased 4 BF Goodrich Advantage T/A tires yesterday. Pleased with the smooth ride so far but have not had the opportunity to drive on wet roads or snowy conditions. I received a price quote in advance and had new tires installed and balanced in less than an hour. Excellent customer service. Great tire for the money. Better than the Michelins the car came with! Would recommend these tires to anyone! I bought two tires for a great price. Awesome tires for an all season. I would buy again and the service at this shop is outstanding. They were very good tires. Great tires, low road noise. Will definitely re-buy for my car when needed. My tires run so much smoother now. They feel great! They also have a quick response time in both rain and snow and enable me to feel secure when I drive in different weather settings. I would definitely recommend this tire brand to others. These are the BEST TIRES that I have owned on this vehicle. Pretty good tires. Nice traction in most conditions. Tread holds up pretty well. Tested and tried. Beautiful tires!!! Looking for wide 15 inch tires for my 2x4 15 inch truck rims, would like little wider on rear. Good quality tire for the price. Got about 50K miles on this set consisting of mainly highway driving before they hit the wear indicators. Has one tire in the set that was very noisy. Overall, a good tire for the money but going with Uniroyals on the replacement set. in wet or snow very poor. great dry performance.